Pilates based exercise emphasizes the mind-body connection by focusing on the movement control of the whole body, beginning from the “powerhouse” core muscles and working outward. This exercise and postural education concentrates on regaining desired functional movement patterns, restore postural alignment and improve balance strategies which carries over to daily activities and recreational sport. 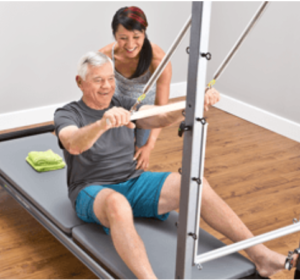 Comprehensive Physical Therapy provides one-on- one Pilates sessions as well as Mat classes with props (large and small exercise balls, air stability discs, foam rollers and resistive bands). Please call and ask to speak with our certified instructor, Dr. Kim Bozich PT, DPT, CSCS, CPT-PMA to see if this type of Pilates exercise is appropriate for you.